Here is a redo of an image I took several years ago. As my technique has improved over the years I've redone this image several times, this version uses masked stretches and split star processing to bring out the nebula while keeping the stars from bloating. Click on the image to see my earlier attempt. St. Croix Observatory, St. Croix, N.S. Processing This image was processed entirely in Images Plus. Calibration used flats, flat darks, darks and bias frames. 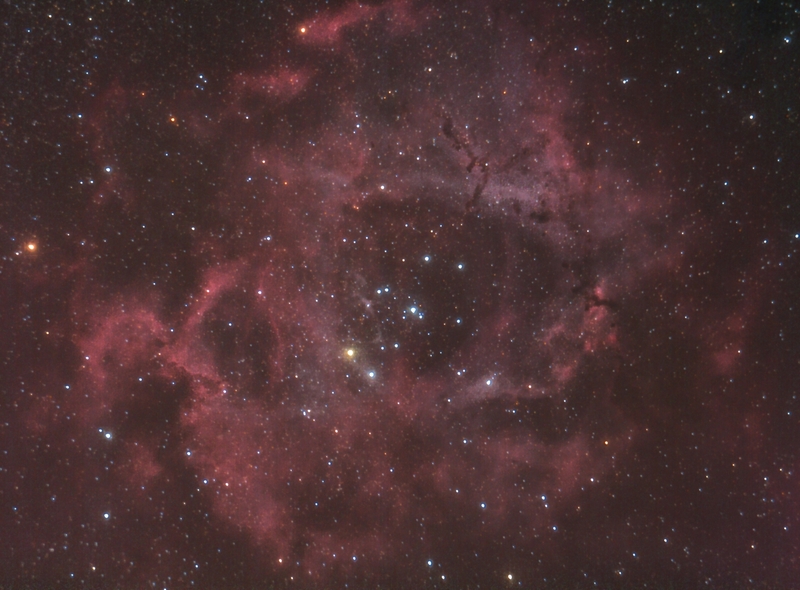 The image was processed using split star processing and used masked stretches to control star bloat. The background was neutralized to remove a red bias and the stars split out of the image using the feature mask. Additive colour balance in LAB mode was used with a mask to enhance the red in the image. Multiscale decomposition was used to enhance and sharpen the nebula image and a statistical filter was used to take down the noise. The stars were recombined with the enhanced nebula and the saturation boosted a bit.